First, this animation is a work of art. It exists by itself, independently of other musings. To this I add: this entire site with all the artistic creations (dances, poems, texts, videos, music, graphics, fashion, comics, video games, movies and more) of my own authorship and contributors, aims to present and disseminate my written work, especially the one called “Géa” which can only be read in CCDB Books, a section of this same site. In “Géa” born Ky, the greatest dancer of the universe, daughter and lover of Clausar, the mystic. Ky frequently travel for many planets, and on each presents itself as if she had been born there. To do so, so as not to arouse suspicion of being an alien, she adjusts her physical body to the biotype of the dominant species there. It was the case of the Earth, where Ky danced the ballet that this video presents. She danced with the ghost of Nysio Degan, dancer killed in her defense, an adventure recounted in “Géa”. Closed the dance, Ky reappears during the end credits and regains her natural physical proportions of geóctone - the transformation is subtle and quick, you will see it at the end of the video. This chapter of “Géa” (in the best Portuguese language) will tell you how it was another dance of Ky, on the planet Géa, with Nysio Degan still alive. Disguised as a Terran, Ky flashes her írios (eyes) as the humans: the two together, as it appears during the animation. The geóctones (people born on planet Géa) flash one eye at a time and much faster than the Terrans, so at least one írio is kept open. I started to animate Ky dances Proust Remembered at December 30, 2012 and worked more than full-time - including Saturdays, Sundays and holidays - until mid-March 2013. Instead of four hundred thousand hours (sic) as seen in the credits of the feature-length animations, were merely a few hundred hours of intense work, hard, but extremelly pleasurable and at the limit of the possibilities of my production computer, incomparable to the workstations of the major film companies. Instead of a team as is seen on the credits of the feature-length animations, with hundreds of professionals and the latest equipment, I worked entirely alone, with an average computer AMD FX 6200 Six Core Processor 3.82GHz - but the machine was brave and pierced days and nights rendering without being disconnected, the sequence of TARGA frames through 3DS Max 11, after which the computer worked long hours in converting the video to MP4 format through the Adobe Première Pro CS6. So, if we do not count the time I invested in the composition via Cubase 5, the arrangement of the Proust symphony (the ballet theme), and composition of the Theme of Living Subatomic Particles, of my own, that plays during the end credits. 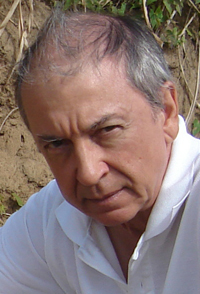 And if we do not consider the decades of work in writing “Géa” and creating the passive and active pages of this site, all geared to the same goal: to promote and publicize the written work, especially “Géa”, helpful to Portuguese language, to Brazil, to the Portuguese-speaking countries, to the individual and to the society. Download the video to your computer (do not try watching it while downloading from this site). After downloading it, prefer Windows Media Player to watch it, but you can use other players like Media Player Classic. Watch the video in a dark environment and in full screen. Use the best audio system possible because the two songs present in the video have high quality stereo recording (two channels) and the audio spectrum reaches from below to above the audible frequencies, especially with powerful very low bass. I suggest using a computer to perform well, provided with good video card, so that the animation flow without stoppages or shakiness. 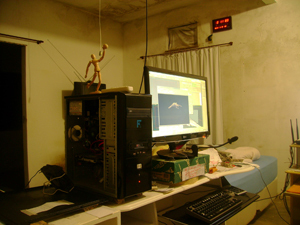 On the computer (mentioned above) where I produced the animation, with the GeForce 9800 GT video board, and even with weaker computers (which is the case of the one I use for Internet navigation, a simple Pentium D), with medians video cards, the video has a spectacular performance. Much better than the video is your imagination. And to feed her, the best is read “Géa” where you actually attend the dances of Ky.
“Géa” contains a lexicon twice that of William Shakespeare in all his work, six times that of Camões in “The Lusiads” and was written by a Brazilian in Brazil. This lexicon is not fastidiousness nor difficult; the words are the noblest, most beautiful and accurate, which describe and convey more with less - and to greatly facilitate the reading there is in CCDB Livros (CCDB books) the dictionary “Book Thirteen online” exclusive of “Géa”, with instant response. The sonority of “Géa” surpasses the legendary sound of the Golden Guitar and the CCDB Audio Products. In “Géa” and the complete works of CCDB you know up close and inside thousands of characters, starships, and only then can you understand the scope of the Movement Géa in which this animation fits and of which you can also participate by contributing free with any type of composition (for example, among the arts mentioned on this page) that, with your permission, will be displayed on this website for visitors to download for free, as this animation. If you want to compose music to post here, this page (in Portuguese with some English text) will guide you. The character Ky, in the animation, is represented by a “dummy” that I created in old 3DS MAX versions until I developed the look achieved in the animation. I am aware that this dummy does not have the skeleton (bones), skin and other computing resources of latest video, which my computers capabilities does not reach. For this reason, you will see joints between the bodily parts of the dummy instead of a skin that coat the entire body, making it one piece (mesh). The neck of the puppet Ky is simple, almost cylindrical, but the only viable for my resources. The doll has not a flexible waist nor bendable shoulders. The hair does not have separate filaments, but I've been using hair more refined than that of Ky in other dolls, as is the case of the puppets of Talia and Ra. Among other merits, the work in this animation had to force myself to improve the dummy or doll of Ky (despite of the computer limitations), because I had to move her limbs and make the doll adopt very special positions that display parts normally hidden, which I conformed with the immense care needed to maintain the overall silhouette of the dancer's body without deforming it. The learning will be useful for me to develop more perfect dolls, not equal to the beings of the physical world; yes, as comparable as possible with the beings alive in the imagination of my Readers. 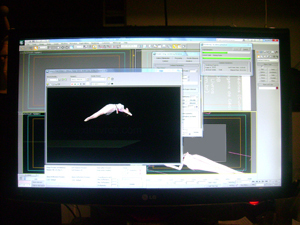 Despite the limitations it imposes on me the computer, the result is beautiful to behold in animation ballet! And serve as an inspiration not only to those who read books, but also for enterprises and professionals, with appropriate resources, to make to the characters and the texts of the books of my authorship the same that is done in other countries to the characters and books which do not reach the quality, perfection and beauty of the works published on this site: “Géa”, “Geínha”, “)que(”, “CCDB - Gravação Profissional (CCDB - Professional Recording)” and the unpublished “We, Mutantes”. I am deeply grateful to my great love, the beautiful and brilliant Dalgiza, who gave me the great idea of representing the ghost of Nysio Degan through a small light. I was going to make it invisible, only showing Ky dancing, as materialists would see, but the idea of the light allowed me to make the dance more believable - eg when Ky is raised into the air by the force of the ghost or when she turns round about him: instead of a center and force vectors imaginary, the viewer sees this center and intuits the vectors, the influence of powerful emotions and even the ghost! Thanks also and equally to Rafael Borges Dias Batista - RDB, my beloved son with Dalgiza, the ideas and the continuous and extreme support on the improvement and maintenance of computers, network and all the modest but complex system that allowed me to create the ballet in computer graphics, the arrangement of the symphony and the music of the end credits. I thank AMPLA (supplier of electricity) not having missed electricity (usually done) at least during the rendering of the TARGA files and the convertion of them into MP4 files. I thank Oi (supplier of Internet connection) for having repaired the Velox (after two trips of Dalgiza to the PROCON - consumer protection agency). I thank to Géa and Géo (Géa is the Feminine part of God, and Géo is God - as told in “Géa” opus), being part of both and of you who is reading this page - We are One and Many. I render here strong, admired and happy tribute to the artists who inspired this animation: Ky, Nysio Degan, Camille Saint-Saëns, Proust, Roland Petit, Natalia (Natasha) Makarova and Denys Ganio. Please do not publish this animation on other sites nor pass the video archive directly to friends and acquaintances. I ask that in any case you refer the possible stakeholders to this page, so that the animation and this website meet their salutary purpose. In advance thank you for your understanding and cooperation. The animation Ky dances Proust Remembered is an invitation for you to read “Géa” after download and watch the video! Read “Géa” in CCDB Livros! The animation is likewise an invitation for companies and professionals specialized in computer graphics and movie to seize this animation and the text of the books of my authorship as inspiration to create works in the state of the art, which avoid exactly match the physical appearance of the people in the real world (which they so far have failed to taken at distances of less than six meters, even in the most recent feature films); yes, that they try to match the Reader's imagination, the Reader when reading and knowing the mirific characters in the books! The books of my authorship can only be read in CCDB Livros! Since I launched this page on April 21, 2013, the ballet Ky dances Proust Remembered has been downloaded to the computers of more visitors than all other videos on this site together - and on the first day that record has been already achieved, although other videos are downloaded much and have forced me to install this site on a very rapid Virtual Private Server (VPS) to keep the site on the air. I downloaded and watched your creation, as always you are expert in what you claims to do. Congratulations! It took me a while to realize that the partner of the ballerina was a ghost. So my brain has built a hidden image of the dancer that complements the dance moves, giving meaning to the gestures of the dancer. The effect was most incredible to see me as the dancer, since the imaginary construction of the figure almost forced me to consider my movements imagined. I did the procedure suggested by you on the site and watched with the due quality. SENSATIONAL, the movements Ky uses in the dance, the whole context of this production, the music! Ky's eyes caught much of my attention, they convey a feeling unexplainable. The animation is a very good trip to enjoy. Ky is very sensual and beautiful. I feel somewhat intimate of this animation thanks to what I know about this wonderful character, FOREVER BEYOND I will be grateful for it. I am very happy to see the interaction of people with Géa. Increasingly! Very interesting view of such 'Sergião', like the term 'intoxicating'. I agree! BRAVISSIMO! I will watch the animation several times, but I leave here my first opinion. I watched your video and liked it a lot. I really need to read your book in order to fully understand the history and context of dance Ky. Thanks for resume contact, the video is very interesting, congratulations for your work and dedication, I am learning a lot just to know and how are their artistic processes. I will pass on to people who are interested in true art. When your e-mail came, downloaded and saw quickly. Today I watched it completely, whole and calmly. Sorry not to have answered before. The Work... is exciting, wonderful!! Thank you for clarifying my doubt. I am referring to the Book Thirteen now (lol) which is helping me a lot! But honestly I am fascinated by reading Géa, very much! Yes, I believe that Alex had told you that I am a dancer at a time without practice, but it will be a great opportunity to be returning to something that will be unique to me and I intend to give maximum power to present them. I am enchanted with the dance and the symphony. It will take a while, I believe, but I hope that my performance pleases you (CCDB's note: with this “you” Kellen means Dalgiza, Rafael and myself). Great Cláudio César Dias Baptista! Exciting interaction with the ghost of Nysio. Worth all the time employed in over this masterpiece! Your creation is of genius. The movements are perfect and articulate. Gives pleasure to watch! Ky Hi-Tech 2014 - the new computer graphics character of Ky! Despite my computer limitations described above, I am creating a new version for the puppet of Ky.
Click on the left thumbnail to see the full size image of the new puppet. The puppet is not finished yet, but can already give an idea of the final aspect of it, when able to be animated in my next project. Click on the thumbnail below to download a preview little movie where you will see the moving hair - it's a mere study, in very low quality image, for the penetration of the body by the hair, wich has not yet the “collisions” resource for impenetrability (to be added), nor the “morpher” modifier to enable facial expressions. The new puppet of Ky is made of one single mesh, able to be animated by means of a CAT-RIG - another puppet which is invisible, situated inside the mesh and connected to it. The new puppet of Ky will have morpher resources to change the facial expressions and several other resources. 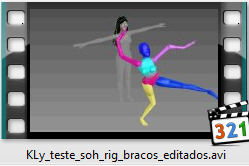 My nowaday computers are not able to render animations with the new puppet of Ky, but I am working on it anyway, because of my love for the character, for dance and especially for the opus Géa, where Ky appeared and can be seen without any limitation, with the best of the resources: your imagination! 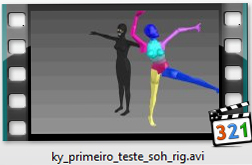 Click on the thumbnails to download two little test animations where the (normally invisible) RIG, which are the bones of the new puppet, not yet connected to it. 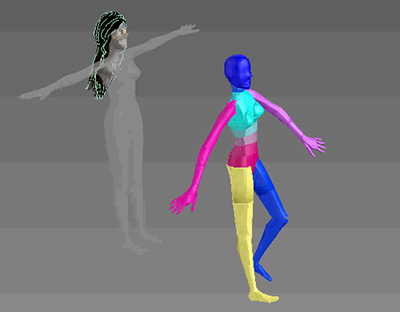 The movement in the first test is best done than in the second, but in the first test the arms are not edited near the body; in the second, they are already edited. Please click to download the first animation and only after the download click and download the second animation. This RIG will be connected to the mesh of Ky and, when animated the RIG, we will see only the mesh moving. Note that, when the RIG is going down, by means of an action on the pelvic bone, the right foot collides with the floor and does not cross it, forcing the leg to bend. To do the same movement with the ballet's puppet, I would have to spend several hours and would not obtain similar precision - the two little animations of the RIG took me only a few minutes to create. Clicking on the thumbnail below, you download and watch the light animation where the RIG of Ky follows a path, predetermined by me. All movements of the RIG are “canned” in a “preset”; sufficed me to create a ball, move it along a rectangular path and force the RIG to follow it. To correct the course of the RIG, so do not walk around the rectangle with its back turned to the front side, it was just to rotate the ball - or I could have done the ball follow a line and guide it through this. You'll notice that the canned movements of the RIG are soft, natural, harmonious and even mocking, because they are repetitive and it was enough to animate a step and then extend it to all the preset. In ballet there are few opportunities to use canned movements, because there are attitudes, steps, sudden and sometimes completely different movements with every step. The combination of new features (including canned steps, like obtained with CAT-Motion, applied here) with great care to follow good choreography will result in new and more perfect animations of Ky, when my computers and pocket permit or a powerful computer graphics company want to produce animations with this puppet or based on it, always inspired by the text of Géa, which you can only read here, in CCDB Livros. Click on the thumbnail at left to download the file to the first animation test with the new doll of Ky. The movie has only a thousand frames, thirty per second, which results in little more than thirty seconds long - still worth downloading and see. Download first and only after downloading run the animation; trying to watch it directly here without downloading, may produce fails in the presentation. The new doll already has breasts obedient to the laws of physics - they swing with the steps of Ky. The puppet's whole body is formed in one piece (mesh) without seams like the puppet of the ballet above. Hairs follow body movements, however I have not yet endowed them with impenetrability: they traverse, for now, the body of the doll, but it gives an idea of what could be. Click on the left thumbnail to see the full size and perfectioned image of the new puppet of Ky. The face (which was too long and had irregular surface) is enhanced relative to the illustration just above, first under the title “The next puppet of Ky”. I have yet to give the new doll facial expressions (with the feature called Morpher) and a costume that flex with movement and not through the body (via collisions and cloth). I would like to have a better computer, which would allow me to work faster and render with the new puppet of Ky heavy and long animations as the one of the ballet presented in this page. I hope you enjoy this animation test, the very first presented in public where the dummy of Ky flexes. There are more English Pages for you, here on this site! This page appears correctly formatted on the browsers Firefox, Chrome and Safari. It also appears correctly formatted on tablets running Android (tested with Coby Kyros MID1126 tablet, running Android 2.3). On the browsers iExplorer and Slim the formatting is aceptable, although imperfect. On the browser Opera the formatting is the worst, but the page is readable.